British flapjacks are not to be confused with American ones. In the States and Canada, the name flapjacks is often given to pancakes, usually the ones served with maple syrup. British flapjacks are made with oats, sugar and syrup and are baked in the oven rather than on top of it. I have a great fondness for flapjacks. They were the first bake I managed all by myself as a child. They’re quick and easy to make, keep well and are very tasty. These oaty delights also require little in the way of washing up – win win. I often add fruit to my flapjacks, but I’d never tried adding carrots and walnuts before. What a great invention. These carrot cake flapjacks are flavoured with warming spices and flecked with autumnal gold. They are a little bit crumbly, but look rather fine I feel. They’re also delicious. How Do You Make Your Flapjacks? I’d be interested to know what unusual ingredients you’ve added to flapjacks and what you thought of the results? Or perhaps you have an amazing bake you use carrots in? Do let me know. Chewy flapjacks with flecks of autumn gold and the flavours of a classic carrot cake. Melt the butter in a large saucepan over a gently heat with the syrup and sugar. Press into a 22cm (9") sq silicon mould or lined tin. Bake at 180℃ for 15-20 minutes or until the top is set and golden. Allow to cool completely, then cut into twelve slices. I’m sending my carrot cake flapjacks off to Treat Petite with Cakeyboi and Baking Explorer. They also go to Feeding Boys for Simple & In Season. And lastly, I’m sharing them with Bake of the Week at Casa Costello. For more carrot recipes and ideas, you might like to head over to my Carrot Recipes board on Pinterest. Thanks for visiting Tin and Thyme. If you make these carrot cake flapjacks, I’d love to hear about it in the comments below or via social media. Do share a photo on social media too and use the hashtag #tinandthyme, so I can spot it. For more delicious and nutritious recipes, follow me on Twitter, Facebook, Instagram or Pinterest. Carrot Cake Flapjacks. PIN IT. What a tasty idea for flapjacks! I think these would be brilliant packed-lunch fillers too. I do love carrot cake – and carrots in general. Never thought to add them to a flapjack but it’s a great idea these look delicious! Thanks Lucy. I’ve hardly ever made carrot cake. I’m not at all sure why as I do like it. Those flapjacks look soooo good. I really need to give them a go, they would make perfect lunchbox snack. Thanks Jo. It is indeed a good combination and I just wonder why it’s taken me so long to try it. Grated carrot is so great for stirring through all kinds of bakes – brilliant idea to use it in flapjacks! They sound yummy. I haven’t made flapjacks in ages. It really is Becca and I don’t use it nearly enough. Carrot cake deserves to be a favorite! I know it’s mine! I’ll take carrot cake over chocolate even! This looks amazing! I love all the veggies and flavors packed in it. Thanks Julie, they are delicious and really easy to make – always a bonus. well these are just utter genius… I am SO making these! I’ve pt a few things into flapjacks before but I think the best have been honey and fennel seed. Flapjacks are such a great vehicle for all sorts of thing – honey and fennel sounds gorgeous. I saw these on Instagram so I had to come over and find out more; I think it’s a great idea! 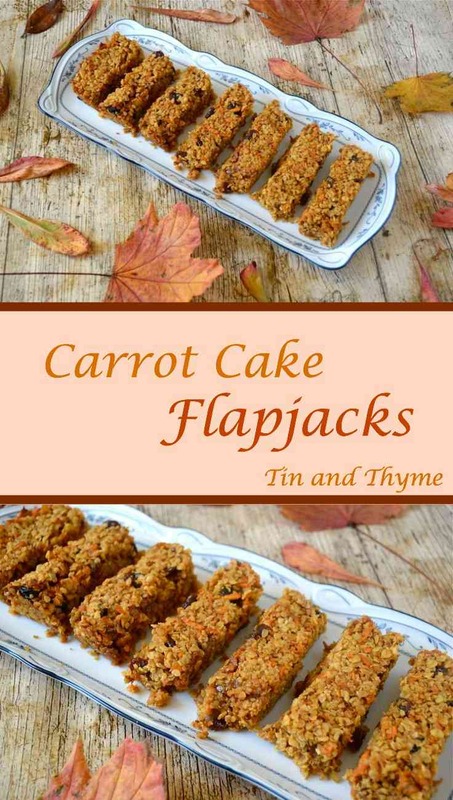 Good idea to put carrots into flapjacks ! I’m sure it works well. Other bakes with carrots: did you ever make a Swiss ‘Rueblitorte’ ? That’s a real classic over there, and rightfully so, because it is delicious. It is a light, moist cake with lots of grated carrots, eggs, sugar and almonds and a little grated lemon rind, and topped with eggwhite glazing and carrot-shaped marzipan as a decoration. It is also glutenfree ! The taste gets better and better from day 3 after making it. Hi Henk. Can’t believe I missed this comment from you. Swiss Rueblitorte sounds really good and no I’ve never made it before or even heard of it. Anything with marzipan generally gets my vote. Something else to add to the list. Ooh roasted fruit Kate. Now that does sound interesting. I’ve made them with fresh fruit before – apple and blackcurrants spring to mind, but I’ve not tried roasting the fruit first. Lovely idea. I do apologise Jenny. One year on and I’ve only just seen your comment. Not sure how that slipped through. Did you ever try the flapjacks?